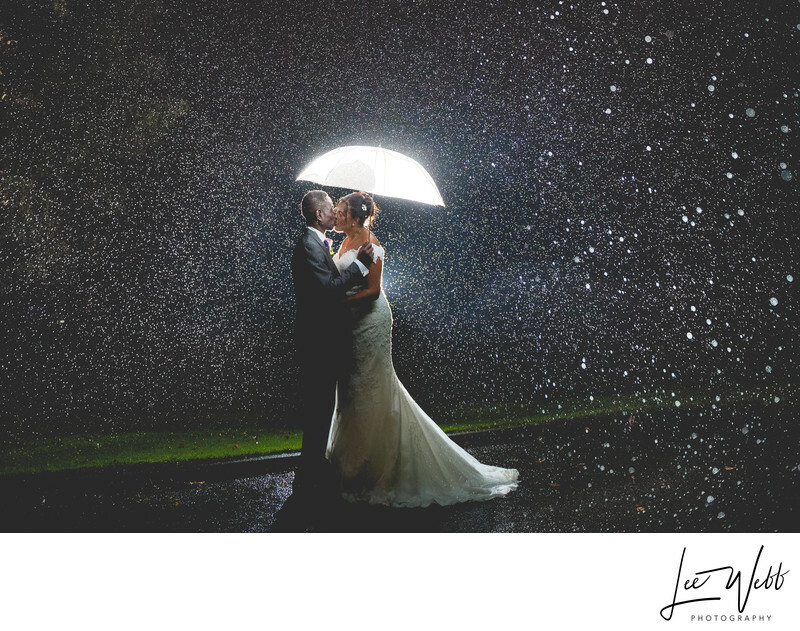 A bride and groom pose in the rain for photographs during their wedding reception at the Kings Norton Golf Club. The Kings Norton Golf Club clubhouse, Weatheroak Hall, is a stunning Grade II listed building. Originally built in 1750 for the Mynors family, the Mynors crest still sits over the door. The hall was extensively rebuilt in 1884 to include all of the outer buildings which remain on site to this day. The hall has been owned and operated by the golf club since 1967, and has been hosting weddings for years. Weatheroak Hall is licensed for civil ceremonies and up to 300 guests can be seated in the ball room. Jacqui and Howard got married at Kings Norton Church, and had their reception at Kings Norton Golf Club. 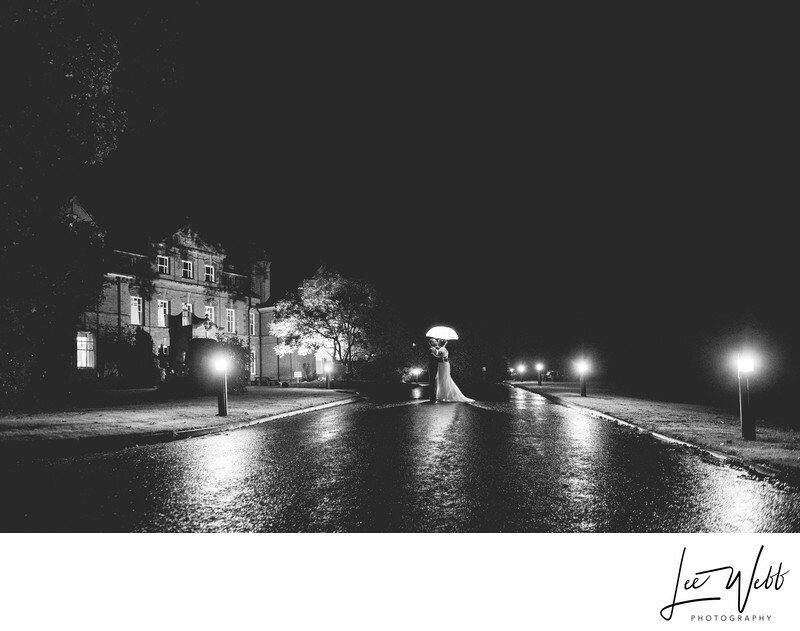 Unfortunately it rained for the majority of the day, but we were able to use the stunning Main Hall for the formal wedding photos. Later in the day, after the sun had gone down, the rain subsided slightly, but it was still persisting. That didn't stop Jacqui and Howard from having their wedding photos taken outside though! I absolutely believe that the rain adds to these wedding photos. The reflection of the lights on the driveway really enhances the look of the image, and the white umbrella really helped with the lighting of the couple - I placed an off camera flash behind the bride and groom, pointing back towards me. This provided a beautiful rim light on the couple, and as light bounced off the underside of the umbrella, the couple were illuminated with a really pretty soft light. Location: Kings Norton Golf Club.